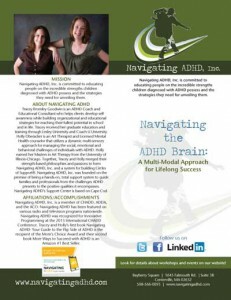 Navigating ADHD Inc. is a solutions-based approach to supporting families whose lives are affected by ADHD. At Navigating ADHD, Inc., we believe that each child is unique and strong and can become all they dream of becoming. When children are supported with the right strategies for their individual needs by their doctors, teachers, and families, they will flourish and grow. We provide the “how” and the support for making it happen! ADHD workshops and ADHD parenting support are available at Navigating ADHD, Inc., in Centerville, Massachusetts. Through our ADHD training services, parents and teachers alike can learn effective skills to help those with ADHD flourish and grow. 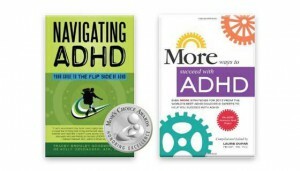 Navigating ADHD Inc. Seminars and Workshops are geared toward professionals in the fields of medicine, education and mental health as well as for families dealing with ADHD. These highly innovative and engaging programs are geared toward adult learners with the goal of equipping attendees with skills necessary for successfully managing the daily challenges of family life in relation to an ADHD diagnosis. Strategies presented are specific and created for immediate implementation and ease. Topics such as academic achievement and inspiring positive behavior are explored through informational presentations, visual aids, discussion, and attendees’ self-reflection. Each seminar or workshop participant also receives targeted, take-home materials for use with their patients, clients or families.